La Communauté compte aujourd’hui 240 familles, originaires en grande partie du Maghreb, mais également de la région d’Alsace et d’Europe de l’Est. Elle s’est constituée en 1835. Une Synagogue fut construite en 1870. Le Centre Communautaire a été inauguré en 1980. Commerçants, employés, fonctionnaires et professions libérales constituent la majorité de la population juive. Les offices sont célébrés selon le rite sépharade. Aux Archives municipales et départementales, on peut consulter plusieurs brochures concernant cette communauté depuis le XIIIème siècle. Une très importante collection de pierres tombales juives se trouve dans les caves du Musée Archéologique. Il existe aussi de très nombreux documents concernant l’époque des Ducs de Bourgogne et la période de 1795-1905. Cliquer sur le lien ci-dessus pour connaître l'historique de la Synagogue de Dijon du point de vue de son architecture. 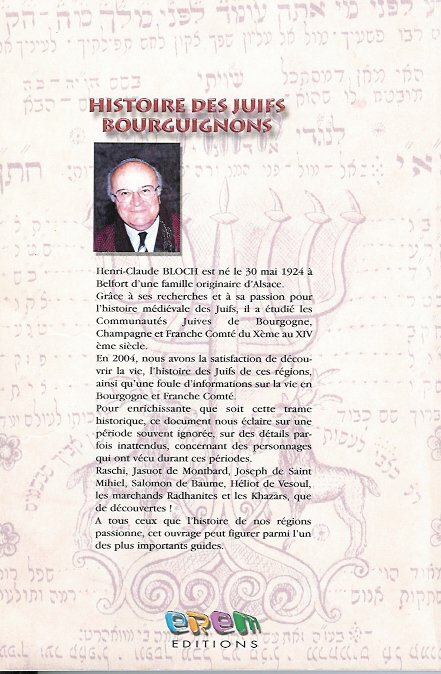 Ci-contre et ci-dessous, collection privée de cartes postales de la Synagogue de Dijon mise à disposition par Henri-Claude Bloch, ancien Président de la Communauté décédé en 2008. Dijon, Châtillon, Beaune, Nuit, Arnay-le-Duc, Saulieu, etc, had jewish quarters or streets of the Jews. Jews had many difficulties in order to possess a piece of land dedicated to the shrouding of the dead. The law allowing the establishment of a Jewish cemetery was carefully recorded in the public acts (in Dijon, the cemetery was on Grand-Potet street (rue Buffon); in 1250, it must have been quite extended since skeletons were discovered into Buffon street and many gravestones, whole or broken, were discovered in square Rameau. After the expulsion of the Jews of France in 1306, we can still find Jews in Burgundy but their cemetery is no longer tolerated near the city of Dijon: it is transferred 12 km from the city to a locality called “Les Baraques de Gevrey” on the route to Beaune, a hundred paces in the east of the big way (Chemin) (called Courtépée); there is no jew who does not go in his way to pray on the tombs. Under the reign of Philippe le Hardi, a cemetery was anew authorised in 1373 close to the city at the cost of “a golden franc” per head, and this continued until 1395 date of the final expulsion. As you may have noticed many rabbis are cited; it is not impossible that these rabbis may have been known in the Jewish literature of the Middle Ages. Regular accounts must have existed among the heads of synagogues in Burgundy and those of Troyes and Ranrupt. The prayer ritual and religious poetry known under the name of “Siddour of Rachi or Mahzor of Vitry” was beyond doubt widely known in the numerous communities of the old duchy of Burgundy, but they also had a Siddour of the liturgy in Burgundy. 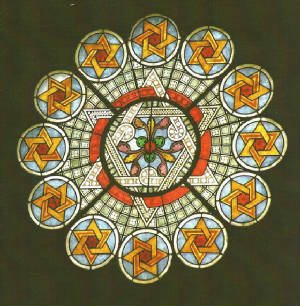 As a result the Rabbis of Burgundy in establishing a special liturgy for the use of their own communities, must have enjoyed a certain undisputable spiritual authority. The “Rabbi of Dijon” seems to have lived towards 1250 and is probably the one cited under the name Rabby in the manuscript registry of the Jewish possessions after their expulsion in 1306. Rabbi Eliezer Ben Yehouda who sets down the Mahzor that his master Menahem B. Joseph had composed in Champagne. Rabbi Eliazar originated from Burgundy and Rabbi Joseph B. Meir of Saulieu was without doubt the son of Rabbi Meir of Dijon. A precious manuscript composed of 24 books (24 canonical books of the old testament) was invented in 1306 and then resold (according to Simonet) to the Jews for 25 pounds of gold. As a reminder, a manuscript scroll of the Pentateuch going back to a high antiquity was kept in Burgundy, a scroll that Maimonides may have consulted ? According abbot Mariller and Clement. Janin. Jews appear in the Duchy of Burgundy, according to the texts only at the end of the Xe century. It is true that the Gombette decree accords them an article stating a high pecuniary penalty in order to buy back injuries inflicted to Christians, if they want to avoid having their hand cut. It is also true , that two canon laws of the Mâcon Council held in 581, fixes at 12 francs, the selling price for their Christian slaves, and they forbid them any job such as magistrate or tax-collector. Jews were excluded from franchises and privileges (Charte of Seurre, February 1245). “Jews were serfs, that is entirely at someone’s beck and call. Their lord could demand from them any price for a tax he wanted , therefore the lord was the one to profit from the Jews’ usury while, for the population, Jews were the ones responsible for odious behaviour”. Jews, which were the lord’s or each duke’s property, were paying an annual quit-rent more or less elevated, such as of one golden marc imposed on the Jew Dieudonné, of Bar, from the son of Hugues from Burgundy in 1250. The city of Chatillon –Sur-Seine was an important Jewish centre; we know this from a chart in 1273 by the duke Robert who gives to his mother-in-law as part of a jointure the manor, the guardianship of the abbey and the Jews of Chatillon. The dominant idea in those last wishes of Robert the II is the reconciliation between Jews and Christians rather than the bitter will to rob each other, a dominant feature in the French legislation by the time of Philippe Le Bel. What happened to the Jews who were expelled from the duchy of Burgundy in 1306 ? A part retired in the county of Burgundy where some apparently obtained the duke’s tolerance and enjoyed passing privileges. From 1311 to 1317, we find here and there, in Dijon and Beneme, old people expulsed from 1306 as well as new names. In 1321, a new expulsion this time by Philippe Le Long, took place in Burgundy, by a decree signed by Philippe V, as harsh if not more, than the previous one. By 1360, Dijon became again as in the past a centre of trade for the Jews of France like the one king Jean determined by law in 1361. The Duke Philippe le Hardi gave the right by law to 12 Jewish families to live and to trade in the duchy for 12 years with guaranties and privileges. Later, another 8 families were admitted in Dijon under the surveillance of two delegates of “La Nation Juive”. The jewish community was flourishing and in 1382,Guy de Corp, a notary registers some marriages. In 1394, the definite expulsion ordinance is signed by Charles VI. Three hundred years later, following the decree of 1791, banished Jews reappear in Burgundy. The Jews upon leaving left behind a part of their own people who were tolerated and accepted for two reasons. Some of them doctors were in possession of useful secrets. One of them Salomon de Baûme, whose wife Marroine was banker of Dijon, while he treated patients, stays until 1417 in the city where his treatments were considered a marvell to the point where a widow in Dijon gave him a pension of 10 francs between 1388 and 1391 in order to treat her. Others followed him of no lesser reputation. Abraham the Jew was the doctor of Henri de Bourgogne count from 1310 to 1318. Master Benoît the physicist, Master Perret who from Dijon came to live in Besançon. Salomon de Baûme surpassed them all by his reputation which often incited dukes and duchesses to employ him: with him, it was Master Elie Sabbat that Jean Sans Peur invited to come to Paris in 1410 and to Brugges in 1411. Those two doctors became secret emissaries and especially Master Mousse, who led to Paris in 1410, the Jew Haquin de Vesoul who became the future doctor of the duke and stayed with him until this prince’s assassination in Montereau in 1419. Apart from the doctors the Jews left in Burgundy a certain number of their own. We are talking about the baptised Jews: Joseph of Vesoul will be calling himself Louis d’Harcourt. In August 1415, there is, in Beaune, a Jew Jean “the baptised of Burgundy” who will be sent in order to translate suspect letters addressed to Salomon de Baûme from his wife suspected to have poisoned water fountains. Jean, Jew from Besançon, is rector of the house of Citeaux of Fixin in 1306. “Simonet the Jew” is notary in Dijon in 1335. All the Jews that came to live in Dijon after the revolution originate from Alsace. Caen(1790), Lévy, Blum, Samuel (1792), Brunschwig (1793), Houlmann, Hess(1794), Picard, Crombak-Sivry (1795), Aron (1796), Joseph (Isaac) (1797), Lyon (Abraham) Israel, Créhange (1799), Lièvre, Salomon (Isaac) (1800), Jacob (1802), Bernheim (1803), Sirque (1804). There are also the families by the names of Cerf, David, Dougas, Fuld, Godchaux, Haas, Heiman, Henstein, Lazard, Mayer, Nathan, Nordman, Polacre, Rheis, Schmoll, Worms, Weil which feature in the registries of 1808 and many of who have still descendants in Dijon. The first synagogue of that period was Rue des Champs; today it is Rue des Godrans. The three Jewish school-masters lived: Simon Cerf in rue du Chaignot, Abraham Lyon, rue Voltaire (now Berbisey), Joseph Isaac, rue des Etioux. The synagogue being too small it is transferred at la Maison Goisset (ramparts of the castle), then in 1829, in a part of the apartments of the Prince de Condé at the lodging of the King (town hall) due to a lease passed in November 1829 according to which the Jews paid 480 francs a year. It was framed on the 1st August of the same year “regulation of order and by law of the Israelite temple of Dijon.” Approved by the departmental consistory of Nancy. In 1841, the city handed over free of charge three halls on the ground floor of the Town-Hall, with its entrance rue Porte-au-Lion, and des Forges. This synagogue remained as such until 11 September 1879. On the 5th of April 1865, a voluntary subscription opened among the Jews an later among the people of Dijon, a piece of land was asked from the city, and after many ups and downs, a decision of the debate of the municipal Council gave to the Jewish community the necessary piece of land on one condition: “Works should start before 1st of January 1871.” The advent of the war yet again thwarted these plans and the first stone was only set in 21st of September 1873 (Rabbi Gerson). What was the situation of these communities just before the Second World War? In the absence of religious statistics in a secular nation, one could not risk any conclusions. The community of Dijon was big enough to have a rabbi attatched. In September 1939, the rabbi Elie Cyper went to the army as army chaplain of the VIIth region. As an evaded prisoner, he accomplished in Perigueux remarkable work. Arrested by the Gestapo on April the 8th , 1944 he was deported to Drancy on the 15th of May in a convoy consisting only of men in direction to Kaunas in Lithuania where they were killed. Numerous Israelites living in Burgundy before 1940 or refugees after the exodus suffered the same fate as the rabbi Elie Cyper. 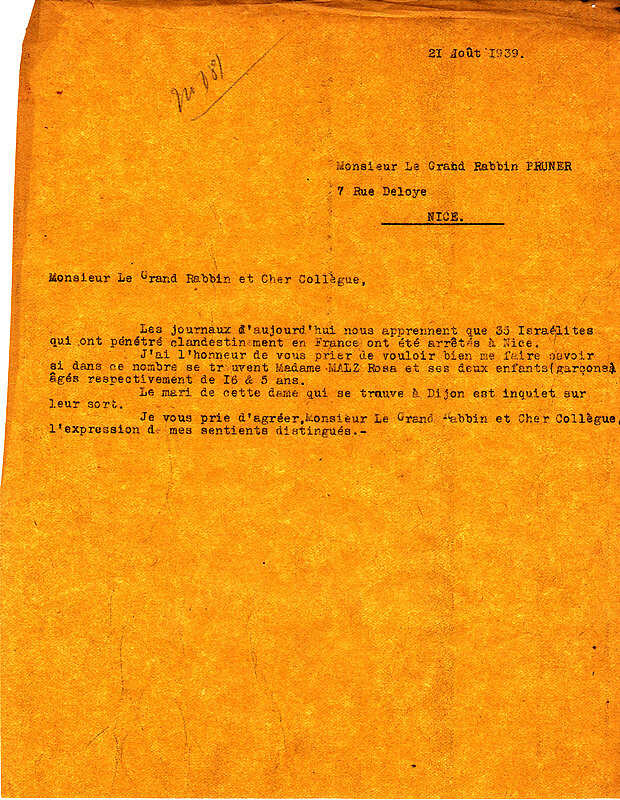 A unpublished report by André Meyer, professor in the Faculty of Sciences and president of the Cultual Association of Dijon, dated July the 28th 1946, specifies: “An important part of the Jewish population of Dijon came in Dijon after the armistice. It is only in 1941 and 1942 that the Jews that came back in Dijon (approximately half of the Jewish population of 1939) took the route to the south zone and thanks to numerous connections succeeded in their majority to cross the line of demarcation or the Swiss border. The first arrests of foreign Jews started in July 1942 and incited everybody to run away from the German measures.” Many personalities from Dijon made these escapes easier: the canon Kir, Professor Connes. The canon Kir prevented the synagogue, which was entirely plundered and from where only the scrolls of the Law were saved, to be destroyed by the Germans. He sheltered and took in Jews in a Catholic support, furnished the fugitives with false papers and handed them over to ferrymen. Despite the Red Cross assistance, the arrests of the Jews were as devastating in Dijon as elsewhere. In December 26th 1942, 10 local Jews were taken as hostages. On July the 13th , it was the turn of 10 more, this time foreigners. 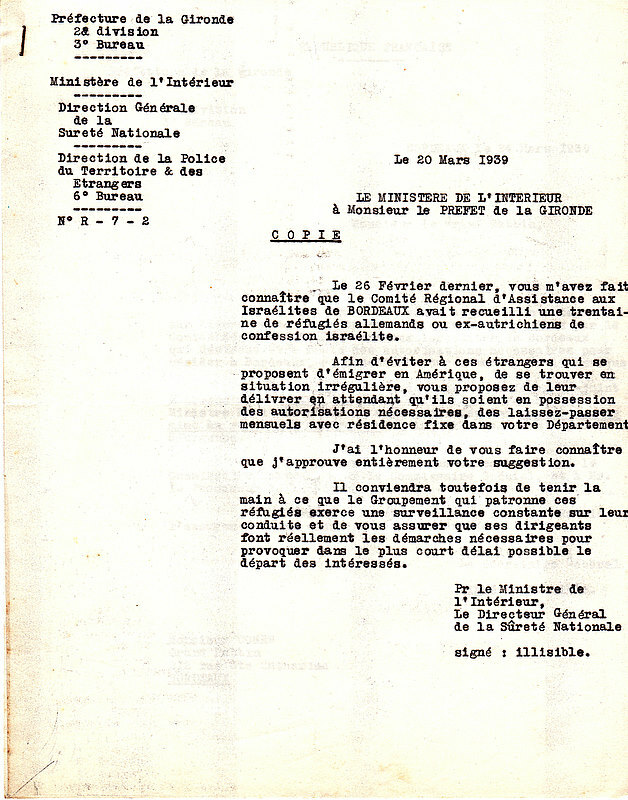 In the end, following the issuing of general orders, in February the 24th in 1944, by the SS Sturmbannfuhrer Hulf to proceed in his circumscription to the general clean-up of the Jews, all the Jews of Dijon were arrested in February the 26th, transferred to Drancy on March and then deported. From the 92 people arrested during this operation in Dijon and its environs, only 2 came back from Auschwitz, which is in accordance with the average proportion of repatriation for the “racially” deported of France. A note by professor Meyer gives an indication about the fate of the children put into public social assistance. A 6 years old young girl in 1942 was taken to the U.G.I.F. by Mrs Damesme with false papers in the name of Davy as well as her two 10 years old twin brothers in 1942. A brother and a sister, 16 and 14 years old respectively in 1942, trusted to the care of the U.G.I.F. were found in 1945 living with the person who had taken them in. On the other hand a 10 years old girl put in 1944 to the care of the French police disappeared. It does not lack interest, even if it may appear tedious, to know the precision with which these arrests were performed. The clean-ups took place in the big cities but no small city was spared either. In Joncy (district of Charolles) the “movement of the administrative regrouping” of 1942 reached 19 foreign Jews. One may note arrests made under particular circumstances. 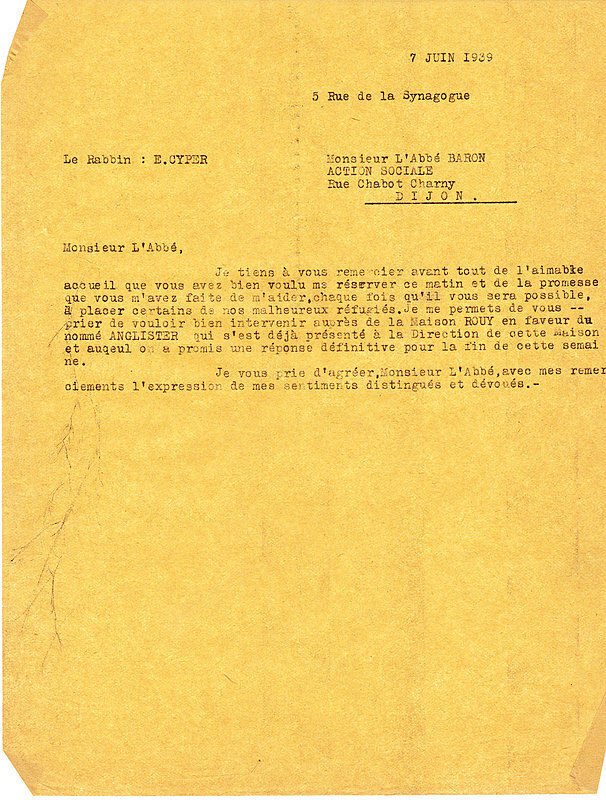 A police officer’s report in November 25th in 1945 by the chief of the police force of Paray-le-Monial, after having given the names of 22 Jews, French or otherwise, arrested in 1942, contains this note:” All these Israelites were arrested by the military of the Feldgendarmerie of Paray-le-Monyal, while trying to cross the line of demarcation during customs control at the train station of Paray-le-Monial. They were in principle sent in the German prison of Autun. Before their departure, they were deprived of all their belongings and jewellery. When delivered to the police force, the German recommendation was to isolate them completely from the other civilians, under pain of punishment for the chief of the force. The treatment suffered at the Feldgendarmerie is not known.”One notes also that Jews were arrested also beyond those more radical clean-ups. In Geugnon (Saône-et-Loire) the Gestapo took hold of two Jewish women, one of Polish and the other of Alsacian origin in April 13 in 1942. In Semur-en-Brionais, in Marcigny, in Louhans, Autun, Creusot, at Sennecey-le-Grand, at Dompierre-les-Ormes, in Tramayes, at Saint-Gengoux-le-National in particular, we note in the department of Saône-et-Loire, arrests taking place under the orders of the Vichy administration. Those arrests do not all coincide with the round-ups of September or October 1942 under the orders of the Germans. Connaissiez-vous l’histoire du train touristique qui emprunte 7 km de la vallée de l’Ouche dans un site superbe que l’on appelle maintenant la Suisse bourguignonne ? Vous roulerez sur ce qui reste d’une extraordinaire aventure ferroviaire d’un membre de la communauté israélite de Dijon. Nous sommes au début du XIX ème siècle. La fabrication de la fonte et de l’acier exige des moyens de transport pour rapprocher le minerai de fer de celui du charbon. Alors, un de ces hommes entreprenants qui vont faire entrer la France dans l’ère industrielle va transformer la région, il s’appelle Samuel BLUM (cité plusieurs fois dans le volume 2 Histoire de Juifs Bourguignons de Henri-Claude Bloch). Il obtient en 1826 la concession des mines de houille d’EPINAC . Il lui faut alors acheminer ce minerai jusqu’au canal de Bourgogne dont la construction s’achève et qui n’est situé qu’à 27 kms. Cet homme s’inspire de ce qui existe déjà en Angleterre mais aussi en France sur une ligne de chemin de fer toute récente qui permet d’acheminer le charbon de la région de St Etienne jusqu’au Rhône . C’est ainsi que le Roi CHARLES X, après avoir déjà autorisé en 3 fois la construction de cette première ligne française jusqu’à Lyon , va autoriser le 7 avril 1830 la construction de la ligne entre EPINAC et Pont d’Ouche, là où le Canal de Bourgogne va passer au plus près. Vous êtes donc sur la deuxième ligne ferroviaire française mais c’est aussi la première fois et l’une des seules que , tenez-vous bien, que tout se fera par expropriations alors que cette voie ne sert que des intérêts privés. C’était déjà exceptionnel à l’époque, ce serait impensable aujourd’hui. Mais les pionniers ne sont-ils pas ceux qui précèdent les lois ? Samuel BLUM va évidemment devoir faire face à l’opposition des propriétaires locaux. Pourtant, il va, comme l’on dit maintenant , se les mettre très vite dans la poche. Eh OUI ! La ligne descend légèrement ; La voie est étrange, on en voit encore un morceau reconstitué au musée de Mulhouse. Les rails sont en effet posés, non sur des traverses mais sur des plots en pierre. Pourquoi ? simplement parce-qu’il n’y a pas encore de locomotives et les wagons remontent à vide tirés par des bêtes qui marchent entre les rails. Ces bêtes ? Elles appartiennent aux cultivateurs riverains qui vont profiter du train minier et regretter l’apparition des premières locomotives en 1855. De cette époque que reste-t-il ? regardez bien. Côté montagne à gauche en descendant et à droite en montant, nous découvrons, quand la végétation ne les a pas envahis, de superbes caniveaux ou escaliers en pierre taillée protégeant la voie des eaux de ruissellement. C’était avant l’invention du béton et l’utilisation des caniveaux pour y faire passer des câbles. Avis aux volontaires, nous avons des pelles, des pioches et des serpes pour tous ceux qui voudront nous aider à restaurer ce patrimoine de bel ouvrage. L’écoulement du charbon va ainsi passer de 5.000 tonnes en 1830 à 160.000 tonnes en 1860. De ce trafic, il reste des vestiges dans le sol surtout vers le terminus, là où l’on se souvient encore avoir vu certains ramasser des morceaux de charbon pour se chauffer. La compagnie du PLM atteint Epinac et permet d’éviter le chargement sur le canal. Notre ligne perd peu à peu le charbon. Est-ce la fin ? Non, car la population en a assez de voir des trains passer sans pouvoir les prendre. Les pressions sont telles que le PLM va céder, racheter la voie et, non seulement ouvrir le train aux voyageurs en construisant de jolies gares, mais surtout prolonger la ligne jusqu’à Dijon. Cela se réalise enfin en…1905. Une nouvelle ère s’ouvre, celle d’un chemin de fer rural avec 2 clients marquants : la cimenterie de Crugey et la plâtrerie d’Ivry.. Mais cette ère durera peu. Lors de la seconde guerre mondiale, le trafic est si faible que l’armée allemande envoie sur le front de l’Est les rails des 15 premiers kms de la ligne initiale. Après la libération, la ligne vivote. Les Dijonnais disent qu’elle dessert les « Trous sur Ouche ». Pourtant un train est célèbre, celui des pêcheurs. Il ne roule que les dimanches. La SNCF, bienveillante, le laisse partir de Dijon très tôt. Il s’arrête à la demande le long de l’Ouche et du canal. Il repart le soir de Bligny sur Ouche et reprend les pêcheurs avec…tous les poissons pêchés bien sûr. En 1968, la SNCF vend tout, rails, maisonnettes et terrains jusqu’à Dijon . Le SIVOM du canton de Bligny sur Ouche et la commune de Bligny achètent respectivement les 7 kms d’emprise de voie dans la haute vallée ainsi que la gare de Bligny elle-même. Est-ce encore la fin de cette ligne historique ? Une partie des informations ci-dessus ont été transmises par M. Jean Yves Tuffery – Maire de Colombier et Président du CFVO.